The reason we need Slow Medicine now is that in every developed country the cost of healthcare continues to increase, no matter what money-saving schemes policymakers put into effect. Capitation, competition, electronic health records, telemedicine, team-based care, bureaucracies for the calculation of value—everywhere the same ideas lead to the same results: healthcare takes two to three times as much of every nation’s GDP as it did forty years ago, patients are ever more dissatisfied, doctors burned out and policymakers frustrated. Yet in my life as a physician, what has impressed me the most is the opposite—how efficient and cost-effective it is when patient and doctor simply have enough time together. There is a secret that economists have missed in their attempts to fix the problem. And that secret is, that what one wants as patient and as doctor is the right diagnosis and the right treatment. But to get that, speed, technology, and efficiency—Fast Medicine—are not enough. What patient and doctor also need, in addition to wonderful technologies, is time. Time may not heal all wounds but it heals very many of them, and having enough time, though so inefficient on paper, turns out to be the most efficient healthcare of all. 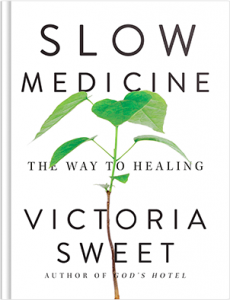 In Slow Medicine: The Way to Healing, you’ll meet the doctors, nurses, and patients, and experience the events that have led me to this conclusion. So as in God’s Hotel, I show and tell their stories but in this new book I pull the camera back and Slow Medicine is both a prequel and a sequel. Jung’s philosophy enters at the very beginning, along with the cultural elements that set up the modern rediscovery of Slow. The twelfth-century mystic, theologian, and medical practitioner, Hildegard of Bingen, contributes the missing piece, with her concept of viriditas—greening—a kind of natural healing power that needs, above all, time and nurturing. What I have learned in my life as physician is that Medicine and Nursing are spiritual paths. They are relational and personal; they are more like parenting and falling in love than providing healthcare off some healthcare shelf. To do them well requires not only enough time but also a deep and hard-won knowledge no algorithm can replace. Miraculously—ironically!—when done this way we end up with not only the most satisfying medicine but also with the most cost-effective medicine. So Slow Medicine: The Way to Healing is an account and a call to action and non-action, with bearing not only on Medicine and Nursing but also on what we need to bring to our own living—the Fast and the Slow together, the right tool for the right task, recognizing that the operation is Fast but the healing is Slow. Will it be coming soon even to its progenitor, the horticulture world? One wonders. Finally. Politicians are coming around to Slow Medicine and the Efficiency of Inefficiency! “Health Minister Leo Glavine says the province’s new doctors will have fewer patients. “The new doctors we have on contract are going to practice differently, what I call slow medicine,” he said in an interview with the Chronicle Herald this week. “They’re going to take a lot more time with patients and take on a lot less patients,” he said, acknowledging the province is struggling under the weight of an aging population, cancer, cardiac and chronic disease.